From The Tudors, episode 7. Katherine Parr’s letter to Henry while Regent of England; during his siege of Boulogne, France. Although Your Majesty’s absence has not been long, yet the want of your presence means that I cannot take pleasure in anything until I hear from Your Majesty. Time hangs heavily. I have a great desire to know how Your Majesty has done since you left, for your prosperity and health I prefer and desire more than my own. And although I know Your Majesty’s absence is never without great need, still love and affection compel me to desire your presence. Thus love makes me set aside my own convenience and pleasure for you at whose hands I have received so much love and goodness that words cannot express it. We hear word of ill weather and delays besetting you and though we thank God for your good health we anxiously await the joyous news of the success of your great venture and for your safe and triumphant return for which all England offers daily prayers. I fear am I but a poor substitute for Your Majesty in the matter of the guidance of your kingdom. I long for your return. I commit you to God’s care and governance. 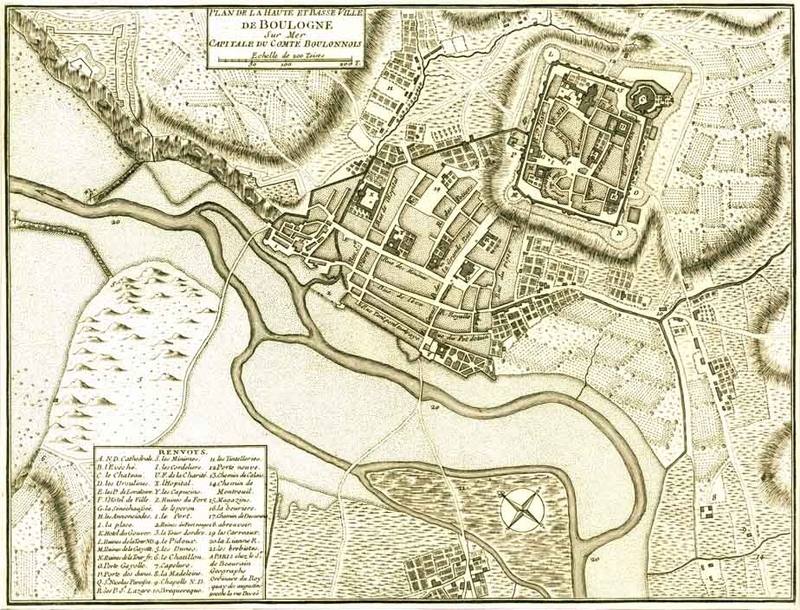 17th-century plan of Boulogne, Fortified Places, by David Flintham. The actual letter which she wrote in July 1544; it was written during Henry’s six-week absence while he was in Boulogne, France and during the Regency of Queen Katherine. Its tone is loving and respectful. Although the distance of time and account of days neither is long nor many of your majesty’s absence, yet the want of your presence, so much desired and beloved by me, maketh me that I cannot quietly pleasure in anything until I hear from your majesty. The time, therefore, seemeth to me very long, with a great desire to know how your highness hath done since your departing hence, whose prosperity and health I prefer and desire more than mine own. And whereas I know your majesty’s absence is never without great need, yet love and affection compel me to desire your presence. Again, the same zeal and affection force me to be best content with that which is your will and pleasure. Thus love maketh me in all things to set apart mine own convenience and pleasure, and to embrace most joyfully his will and pleasure whom I love. God, the knower of secrets, can judge these words not to be written only with ink, but most truly impressed on the heart. Much more I omit, lest it be thought I go about to praise myself, or crave a thank; which thing to do I mind nothing less, but a plain, simple relation of the love and zeal I bear your majesty, proceeding from the abundance of the heart. Wherein I must confess I desire no commendation, having such just occasion to do the same. I make like account with your majesty as I do with God for his benefits and gifts heaped upon me daily, acknowledging myself a great debtor to him, not being able to recompense the least of his benefits; in which state I am certain and sure to die, yet I hope in His gracious acceptation of my goodwill. Even such confidence have I in your majesty’s gentleness, knowing myself never to have done my duty as were requisite and meet for such a noble prince, at whose hands I have found and received so much love and goodness, that with words I cannot express it. Lest I should be too tedious to your majesty, I finish this my scribbled letter, committing you to the governance of the Lord with long and prosperous life here, and after this life to enjoy the kingdom of his elect. This entry was posted in Life as Queen (1543-1547), Reviews of Media: Queen Katherine Parr and tagged catherine parr, letter, Letter to King Henry VIII, Queen Katherine Parr, Queen Regent, Regent of the Realm, siege of Boulogne by tudorqueen6. Bookmark the permalink.